Five days from now the United Nations’ Rio+20 conference will officially commence in glamorous Rio de Janiero. Most of the world’s citizens will pay little attention. With bills to pay and mouths to feed, we have other things on our mind. But there’s a serious problem. Many of the individuals attending Rio+20 think they’re authorized to speak for the rest of us. They also think it’s their job to choose our future. 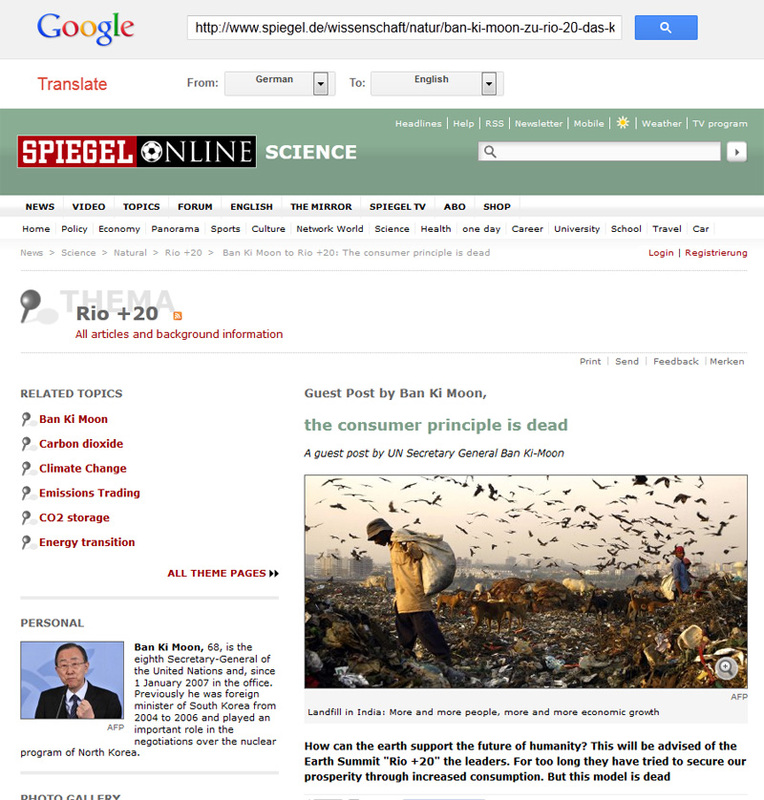 Two days ago an opinion piece authored by UN Secretary-General, Ban Ki-moon, was published in Der Spiegel, a prominent German news magazine (backup link here). 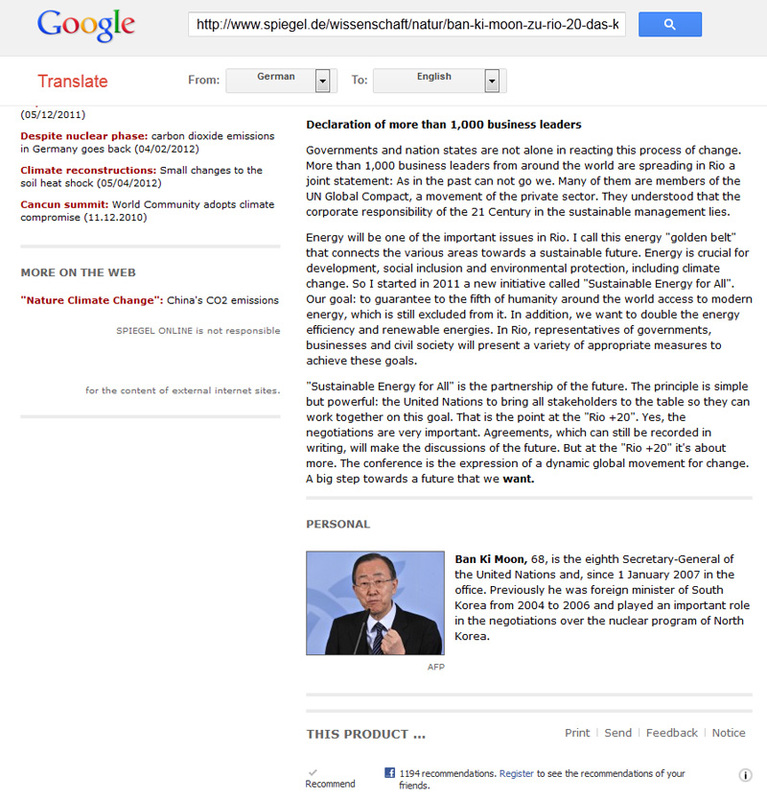 So far no translation – or even record – of it is available on the section of Ban Ki-moon’s website specifically devoted to such matters. So a Google translation will have to do. Contrary to the U.N.’s dire assessment, humanity has never seen a clearer reduction in poverty worldwide. The proportion of people living in absolute poverty has dropped massively, from 52 percent in 1981 to 22 percent today. So the economic model that has, in a mere 30 years, slashed the percentage of the world’s population living in squalor in half doesn’t deserve praise and support. Rather, the UN considers it dead. This is the same UN that has been utterly ineffectual with respect to achieving peace in the Middle East, discouraging piracy on the high seas, alleviating the tragedy of Zimbabwe, or preventing the ongoing massacres in Syria. With smart policies, governments can create growth, fight poverty, create employment and accelerate social progress and protect the natural and finite resources of the earth. Three weeks ago Ban Ki-moon authored another opinion piece for the New York Times in which he said that the participants at Rio+20 will be pursing “a transformative agenda for change” and “a conceptual revolution in how we think” about the future. was to break with the old economic model and invent a new one. Is that so. Does anyone remember having such a matter placed before them on a ballot? Do you mandate your elected representatives to invent a new economic model? I can attest that my opinion has never been sought in this regard. I also suspect that any news team that ventured forth on any street in any nation would have a difficult time finding five people who were aware of this fact. How could a decision so momentous be such a well kept secret? In a world brimming with creativity, diversity, and ingenuity the head of the United Nations is telling us that choices don’t exist. He’s telling us that there’s only one answer. This is not leadership by the people, for the people. There’s nothing remotely democratic about what’s going on here. We have a word for those who believe that their vision is the only acceptable one. They’re called tyrants. 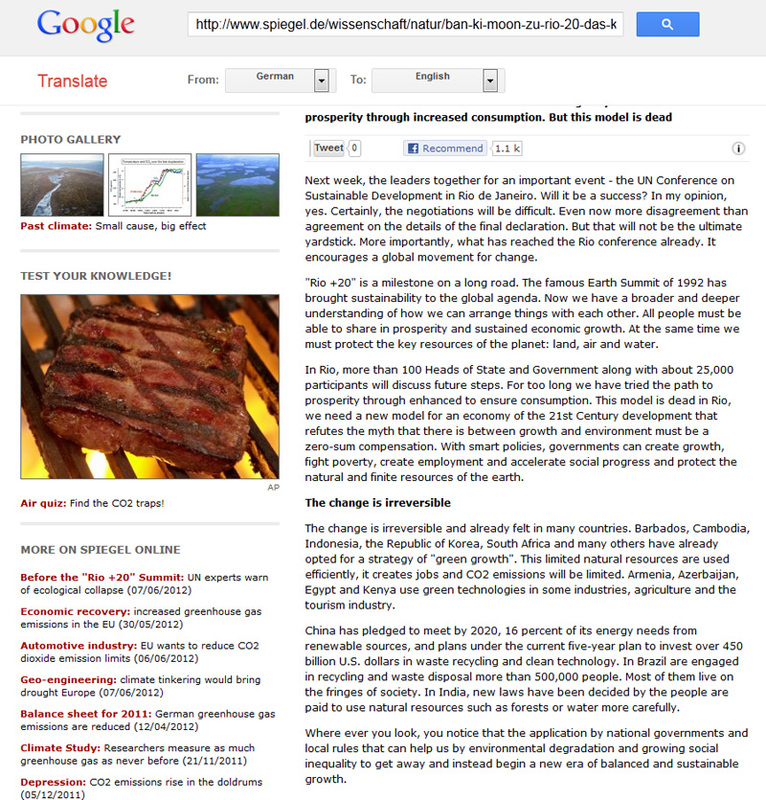 This entry was posted on June 15, 2012 by Donna Laframboise in ethical & philosophical, historical perspective and tagged Ban Ki-moon, Rio+20, United Nations.